Let JobTestPrep help you gain the confidence and skills you need to make a great impression and get the job you want. 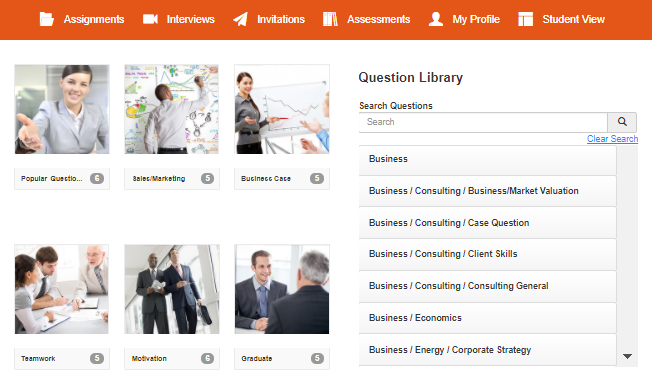 Access thousands of interview questions, record yourself, and learn how to answer common questions. 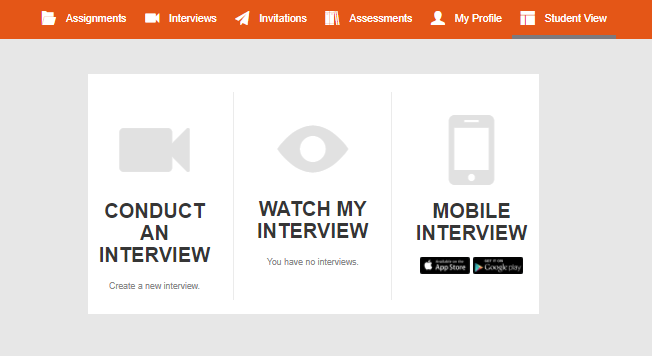 Start practising now or scroll down to see our free sample interview questions and tips. A graduate interview is your time to shine and set yourself apart from the other candidates, which is why it is very important to arrive prepared. Read more to find out what to expect and how we can help you prepare for your graduate interview so you can perform better and land the graduate programme or job you want. JobTestPrep has created a unique PrepPack™ to help you gain important insights into graduate interviews and to assist you in sharpening your interview skills. This pack grants you access to our smart interview preparation software, which includes practice sessions with questions geared specifically to graduates. You can record your answers and then review them using our friendly assessment forms. You can practise using our suggested interview sessions or customise your own session from a pool of thousands of questions. In our pack, you will also find detailed PDF interview guides with experts’ advice on different aspects of interviews, including sample answers and tips for common interview questions. With JobTestPrep’s graduate interview pack, you’ll gain the self-assurance you need to impress your interviewer with your poise and confidence. What Is a Graduate Interview? The graduate interview is the most common assessment for graduate jobs and schemes, with nearly 100% of employers incorporating it into their hiring processes. It can take place in various stages of the process: in the initial screening, at the assessment centre, or as a final interview. There are many different types of questions that can be asked in an interview. The most common ones ask you to explain your CV, describe your job skills, express why you want the job, explain why you are the right candidate, and describe your strengths and business acumen. You may also be asked to solve brain teasers. What Types of Graduate Interviews Are There? See below for interview tips for each of the different interview types. The following is a list of popular interview questions for graduates. Of course, this is only a partial list, as interview questions can vary between companies and positions. What do you know about our company? How did you find information about us? Give me an example of a time when you had to think outside the box to solve a problem. Give me an example of a time you failed. Why do you think you failed? Find out as much as you can about the questions you will be asked in your interview. Online forums of other graduates who have been interviewed are great resources. Research the company. You will almost certainly be asked to evaluate an aspect of the organisation to which you are applying. Get a good night's sleep and a healthy breakfast on the day of the interview. Practise answering typical graduate scheme interview questions in front of a mirror or on video to review later. Watch your body language and your sentence structure. For competency questions, use the STAR method, which is a helpful way to structure your answers. Be polite and thank your interviewer when it's over. If you are expecting a call from the employer, answer your phone in a professional manner. Smile even though the interviewer can't see you. It can have a positive effect on your tone. Be aware of any excessive noise that is in the room or coming from outside, and try to keep it quiet. Have a pen and paper available in case you need it. Silence your phone and turn off notifications on your computer. Don't chew gum or food. Prepare for your Skype call by recording yourself in advance to see how you look and sound. Dress as if you were being interviewed in person. Have good posture and make as much eye contact as possible by looking at the camera and not the screen. Make sure your background is appropriate for a professional interaction. Clean up the area that can be seen by your camera. Bring your CV and cover letter. Make sure you know how to find the building and office so you can arrive on time. Give a confident handshake and smile. Make eye contact and use appropriate body language. Prepare some questions of your own to ask at the end of the interview. Try to find out who will be in the panel so you can look them up online and understand their backgrounds, roles in the company, and main projects they are involved in. Introduce yourself to each person. Prepare some questions of your own to ask each panel member at the end of the interview.